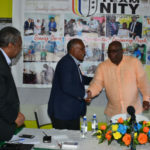 BASSETERRE, ST. KITTS, May 22, 2018 (PLP PR Media Inc.) — Senior Minister in the Team Unity Government, the Hon Vance Amory, has said that relationship between Nevis and St. Kitts has been at its best ever since the advent of Team Unity Government, and directly credits Prime Minister Dr the Hon Timothy Harris for that accomplishment. 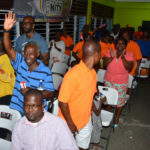 He chastised those who think that Prime Minister Harris does not have people to work with, and dismantled their line of thought by telling them that all the different sectors in the country are running well because there is support in the unity of purpose among the Prime Minister and his ministers and that anybody is able to see that the country is running good. “Under this Team Unity Government, the relationship between St. Kitts and Nevis, people of the two islands, has improved tremendously,” said the Hon Amory, who is the immediate former Premier of Nevis. 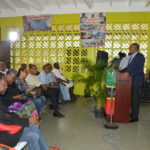 The Senior Minister, who is one of the longest serving Federal Parliamentarians, noted how pleased he was to see the very many people who had attended the Prime Minister’s Open Forum. He said their presence told him that Team Unity Government has a cross section of support because he could see many young people whom he referred to as the future of the country. He however warned everyone to be aware of those he termed as ‘wolves in sheep’s clothing’.